Jessica Orluck, daughter of Ms. Jennifer Orluck of Chittenden was winner of the 2015 Muzzy Davenport Award given each year to a Barstow student for a winning project in a local history competition. She and her family were guests of honor at the Ice Cream Social on July 14 at Town Hall. Her subject was the Flood of 1947 and the role her great grandfather played in warning residents downstream from his airplane of the floodwaters heading towards them. Green Mountain National Forest Archaeologist Tim Watkins gave a slide presentation on the history of the Chittenden area. 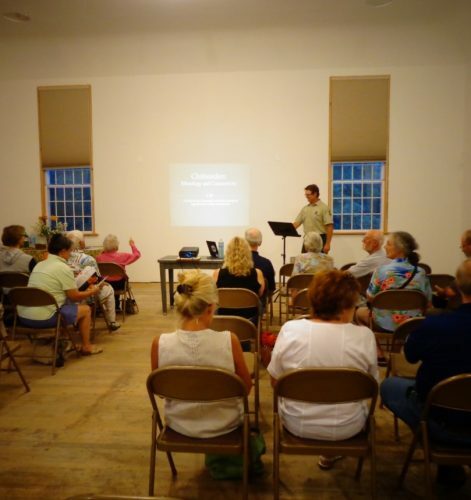 His talk included pertinent town history, popular folklore, and his personal observations in coming to the East from out West. Tim Watkins GMNF Archaelogist speaks about Chittenden history, geology and archaelogy. This was the first program to be held in the upper level of the Grange Hall after the walls were insulated and sheetrocked. The potluck supper at the Grange Hall this year was followed by Vermont Humanities Council speaker and Vermont Folklife Center Co-Director and Folklorist Gregory Sharrow exploring the fabric of Vermont farm culture in the past and probes its relationship to the world of Vermont today. The program was much enjoyed, and local audience antidotes enlivened the event. The annual meeting was held at the Grange Hall with the program by Julia Purdy on eugenics movement in Vermont, in which well-meaning reformers tried to “cleanse” the Vermont gene pool by a sterilization program aimed at the hill farmers, the indigent, and the “feebleminded.” It was not a pretty story but was one worthwhile revisiting. Officers elected for 2016 are President, Karen Webster; Vice-President, Elaine Meyers; Secretary, Marcia Lertola; and Treasurer, Bob Webster; Directors for two years are Bob Muzzy and George Butts. Reggi Dubin and Newt Wetmore will continue to serve as directors until next year. 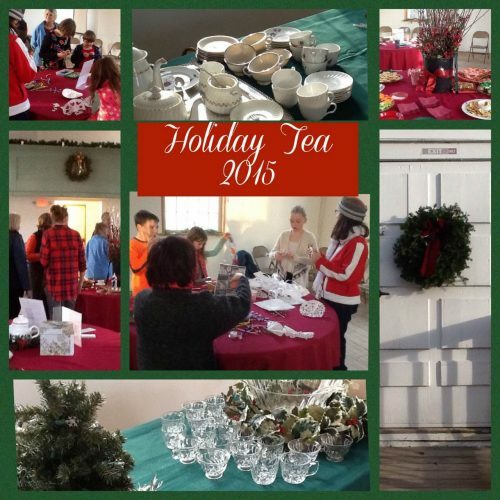 The Chittenden Historical Society does not hold meetings in December, but in 2015, the Society collaborated with the Chttenden Public Library to host a Holiday Tea. The Library provided a craft table for younger ones.